This was a first for me!…returned a few more times, on subsequent trips, before we both retired in 2010. 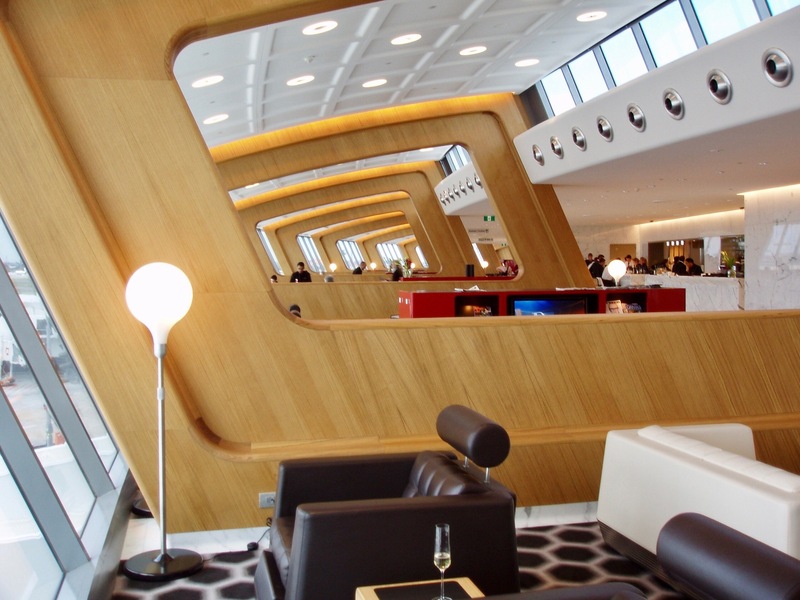 Note the aeronautically inspired fitout – very different to anything we’ve seen before and I read in the Qantas magazine that the design was a world first. On our first visit it had just been completed. Having grown up in a rather ordinary suburb of Sydney, it felt all rather grand (and slightly unbelievable) to be sitting down here for a 3 course gourmet lunch or dinner before our flights; although after decades of feeling like a single/full time working Mum, with Tony’s frequent business trips away, I definitely felt happy to be receiving a bit of pampering! I decided to use some long service leave accumulated from my 15 year teaching career (a condition of employment for workers in Australia). At the time, the restaurant at this lounge was managed by Neil Perry – a famous Sydney based chef who also runs the Qantas lounge in Singapore. The lounge in Singapore is beautiful too. On future trips, we’ll now go via Singapore often (I have a cousin we go to see in Bangkok or Laos + it’s a good stopover on way to Europe) as there’s a new flight connection between Singapore and Canberra – Australia’s Capital. I’m noting the Capital because, while travelling, we became aware that many think that Sydney is the Capital. Canberra is a small city and unlike the traffic congestion sometimes in Sydney, it’s easy to drive around. Canberra is situated between lakes, rivers and rolling hills – a 3ish hour drive from Sydney (a direct highway) or a 4 hr train trip. It’s worth considering a visit (combined with Sth Coast) if you’re planning a driving holiday in Australia. We’re hoping for a fast train between Sydney and Canberra in our lifetime but that might be wishful thinking! We stayed at the Hollywood Roosevelt Hotel which we loved – an Art Deco hotel built in 1929. There were lots of stories presented in various ways within the hotel – about movies, film stars , interesting personalities, etc. I love the cinema – many Australian and NZ, some American, European and recently I’ve become interested in Middle Eastern films too. I follow a site in Australia called SBS Movies. Back to the hotel in LA…Most of the decor was gorgeous when we were there in 2007 but some areas a little tired (but still fine in our opinion…added to character of the place we thought eg. The bar)…consequently we got a good price. I read on the Net that it’s had a recent million $++ renovation so I’m sure the prices will now reflect that. If we ever return…maybe in 4 or more years (we’ve been to a few Middle Eastern countries Trump might not like😉) we would check out the same hotel although our guess is that it might not be within our budget anymore? I’ve been able to find a few images from the Net (our photography wasn’t as good in 2007). It was very similar in 2007 although it looks like the bar I mentioned above has had a make over. 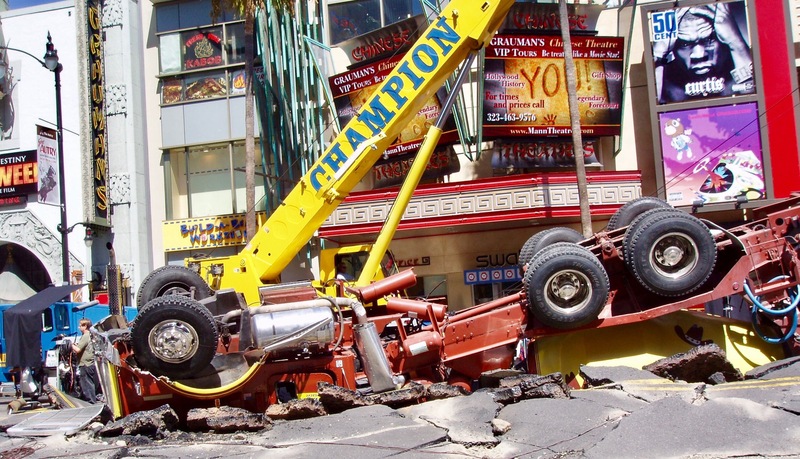 In 2007 we visited Hollywood, LA for the first time – after a long flight from Sydney, we left our suitcases in the hotel so we could check out the very near vicinity and to our surprise, we walked right beside a movie set/acting/filming in the middle of the road (see photo below). Filming stopped and Tony walked ahead to see what all the fuss was about 50 m or so up the road. 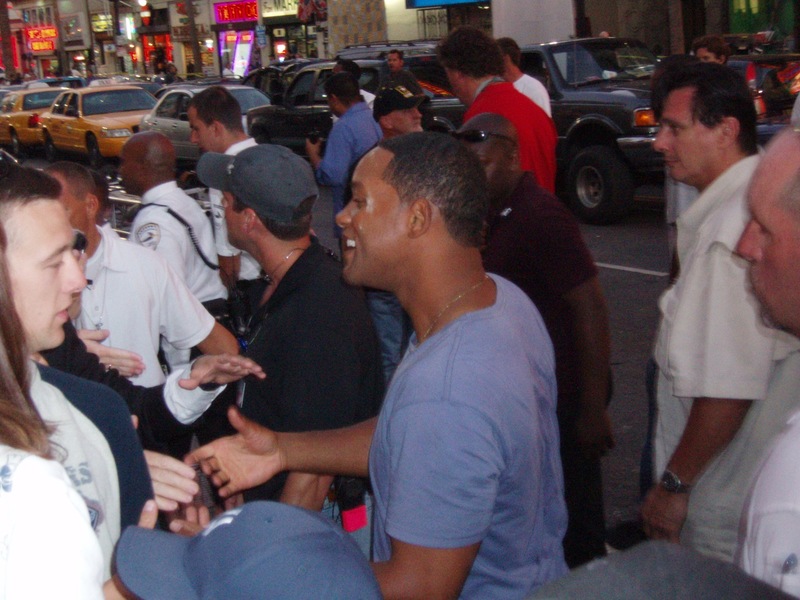 I quickly realised it was Will Smith shaking hands with fans (Tony isn’t up on movie stars’ names etc like me:). While I’ve enjoyed a few of Will Smith’s movies, getting caught up with screaming fans didn’t appeal to me so I remained quite a distance away and waited while Tony tried to take a photo over the heads of many fans! A few minutes later Will Smith walked away from fans and towards me, as well as another couple standing next to me; he shook my hand and had a quick chat – welcoming me to America. A welcome to remember! He was very warm and friendly toward me and the other people, a very old couple who seemed a bit confused about who he was. Later they agreed that it was a very amusing moment. I rang our sons in Australia that night to tell them that we were in Hollywood and meeting movie stars already – of course they thought we were joking! Tony did get 1 photo (below) but not with me in it as, like I said, I was down the road but he did see what happened which was good as he was able to confirm the story when he talked to our sons as well. Not that they wouldn’t believe me but somehow in my foggy, jet lagged state it all did feel rather unreal! Photo below: This was the movie set in the street right outside Hotel Roosevelt; we didn’t notice it as the taxi brought us from the airport – he came in via a side or back entrance. The photo below was one that Tony took over the heads of some screaming fans. As mentioned, Tony’s not one to recognise famous film stars (although he does love movies like I do…one of our favourite leisure time activities) and after I had my brief brush with the famous, he asked me “who was it?”! Tony has an amazing memory for so many things but remembering movies/actors etc. isn’t one of them! 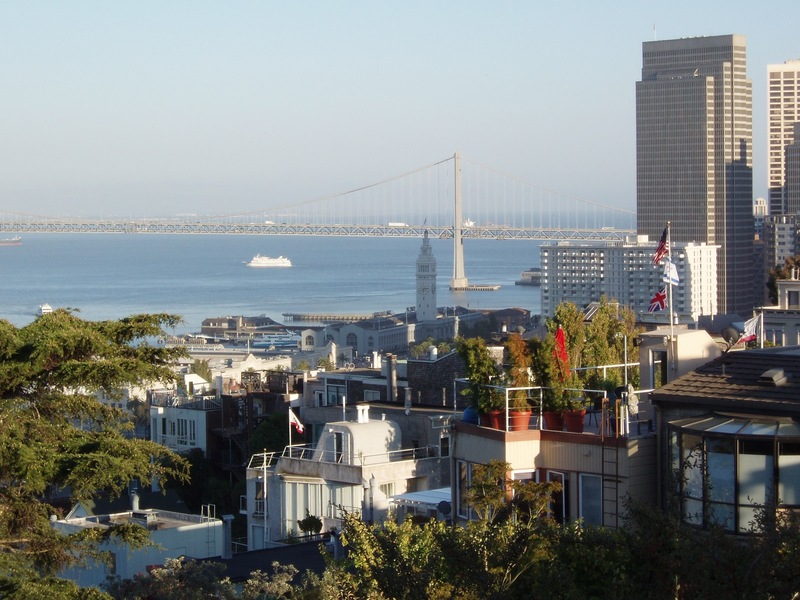 The trams of San Francisco (photos below) add a vibrancy to this wonderful, multicultural city. We used them a lot, both during the day and in the evening, plus we walked for many kilometres – a few too many for my liking at times as we got lost walking to/from the seaside. We found Chinatown along the way and had a beautiful lunch there. After lunch I’d had enough of walking!…we returned to our hotel by taxi. It was a good day but a bit frustrating – fortunately we haven’t had too many of those on our travels especially now we have the Net, online maps, Sat Nav etc. 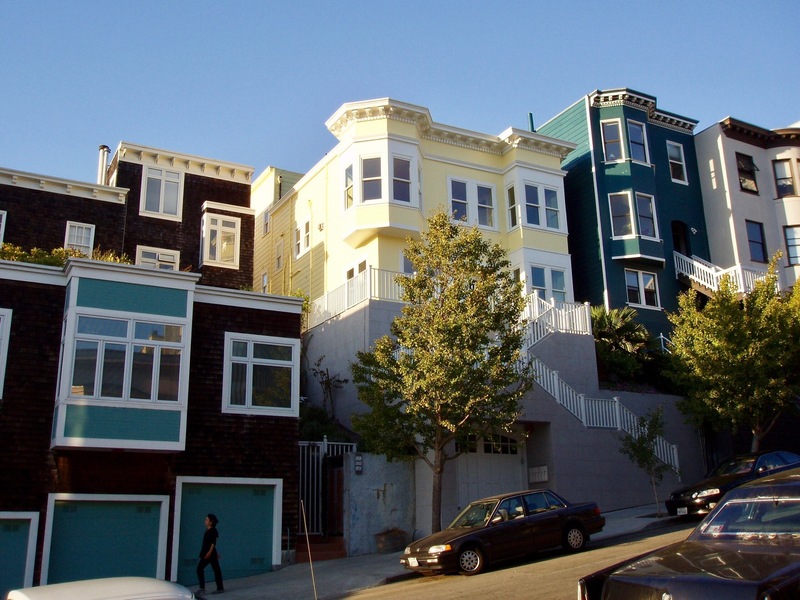 The historic homes and apartment blocks (photo below) around the streets of San Francisco are colourful and unique. We took many long walks often in the early morning and late afternoon. View from a lookout on one of our walks. YOSEMITE NATIONAL PARK – a 4 hour drive (approx) from San Francisco or 7 hours by bus. There is a way to do the trip by bus and train but it takes longer (see Rome2Rio app). Photo (above): stone/timber lodge where we stayed – the room had a picturesque view (next photo). There was a cosy bar (with a large open fire) and a restaurant which we also enjoyed. I’ve left this photo in the large format (hope it downloads ok?) 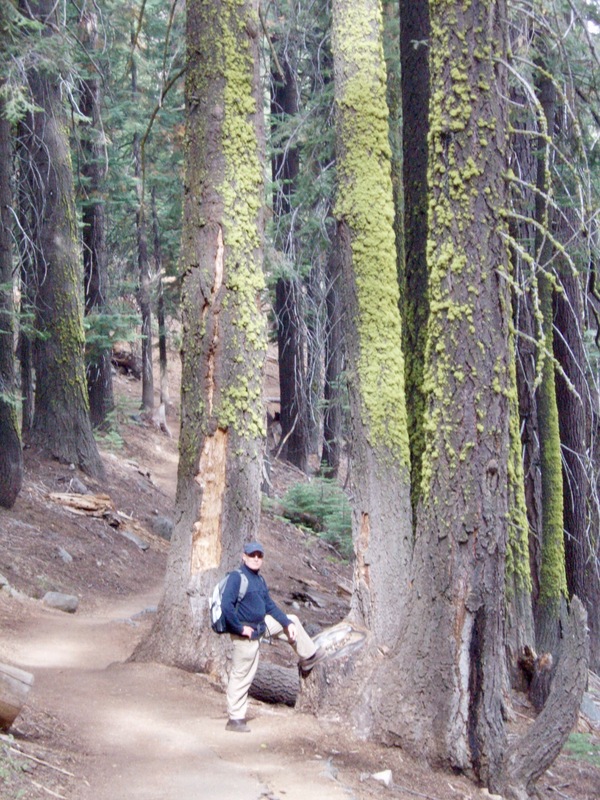 to show how huge the trees were – stunning walk. We went on a guided walk for a couple of hours as well as a self guided walk. We stayed on the recommended tracks and followed the advice about bears – going along a similar path with a small group of new friends we met at the lodge. See previous photo. San Francisco to Las Vegas (a flight); Las Vegas to Grand Canyon (via limo/helicopter!…flight cancelled due to an electrical storm – see photo below); Las Vegas to Washington DC (flight); Washington – New York (train); NY to Toronto (flight); Niagara Falls (day trip in a bus); Toronto to Boston (flight); Boston to Hawaii (flight); Hawaii to Sydney (flight); Sydney to Canberra (a v short flight!). I’ll copy this + photos etc. into a separate post in the future. Our main intention was to have a base from which to see the Grand Canyon by helicopter (would have been my 1st time in a helicopter). We chose a small company (with a good flight record/reviews!) which flew right into the Canyon and served what sounded like a nice lunch there. 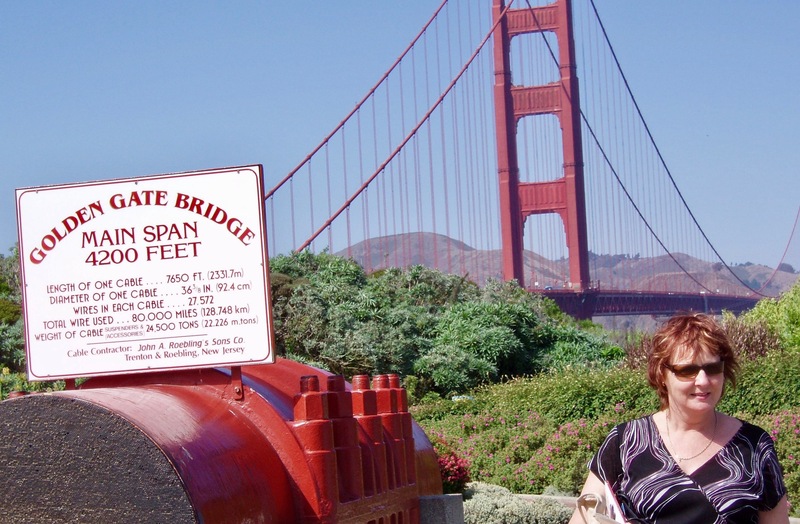 We considered the road trip from Vegas to the Grand Canyon, but it’s a very long drive (many, many hours – check Rome2Rio app); I hate long road trips, especially winding roads, due to my spinal problems…I’m a bionic woman with a fully screwed back but my body only does so much and then protests loudly! 😉 However, I am proud of the fact that I’ve stayed fairly active – I use to do lots of swimming (photo below); not as much now as it aggravates my lower back. However, I love the water especially gentle swimming/stretching etc. at our stunning South Coast of Australia (don’t miss it if you visit here:) – we have some spectacular natural rock pools where easy (or energetic!) swimming is possible. I’ll leave the next photo in large format to give idea of how expansive the view was from the hotel window. 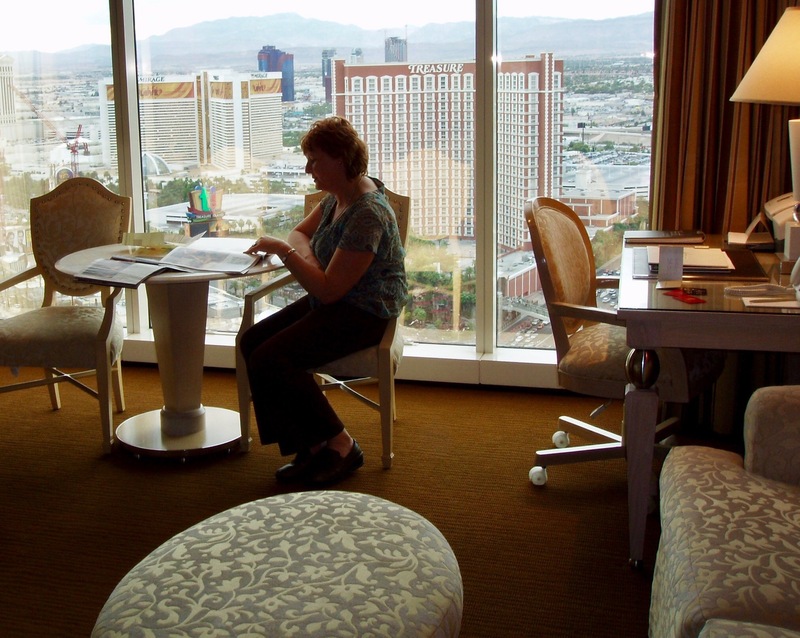 There are lots of flashy/luxurious/massive hotels like this in Las Vegas – many of this size have a casino in or near the building like this one did. I’m not keen on hotels like this (we much prefer small/interesting hotels or B&Bs run by interesting people) but the relatively low price to stay here was appealing. We don’t gamble – not for reasons related to religion or ethics (although of course, sometimes the ethics of people connected with gambling can be questionable) but because Tony is a statistician at heart (a Major in Stats in his 1st Degree) and knows/insists that the odds always favour the house. I can see why people enjoy the glamour etc. of it all, which we do as well – we sometimes like to just go for a drink and enjoy the theatre of it all – a few times we’ve tried our luck – and lost as we predicted…but it was fun at the time. Do prefer going to an interesting bar/cafe/restaurant with some good music rather than the drone of poker machines – they don’t appeal to us at all but I do understand that some people go there for company or just something to do and each to their own I say! I also have an aversion to gambling due to difficult childhood memories related to our father’s gambling addiction – mostly on horse racing and poker machines. Our mother was the sensible one who tried to budget and hold the family together – which mostly she did until she became very unwell in her late 60s. I’m still proud of our flawed (aren’t we all!) but very loving father – he finally (sort of/sometimes!) got the gambling under control and spent many of his final years caring for Mum right through to the late stages of Alzheimer’s disease. He was a WWII Veteran, before they married in Sydney (a very glamorous couple) after the war – interesting thing was that he trained in San Francisco and the UK (Army & the Airforce) and told me stories (happy memories like Vets often do with their families) of his travels. That must have inspired me to see some of the places he talked about and here I am, getting to older age, and it’s been so very exciting and fascinating to see so much of the world. We hope the world stays peaceful and there are no more world wars (even better, no more wars anywhere but I know that’s being idealistic) so our grandchildren (and yours if you have them) have similar opportunities. Las Vegas…on our way to the helipad via luxury limo (a first time for me) – we had a cocktail along the way but half way into the drive we were informed that there was an unexpected electrical storm and our trip had to be cancelled. 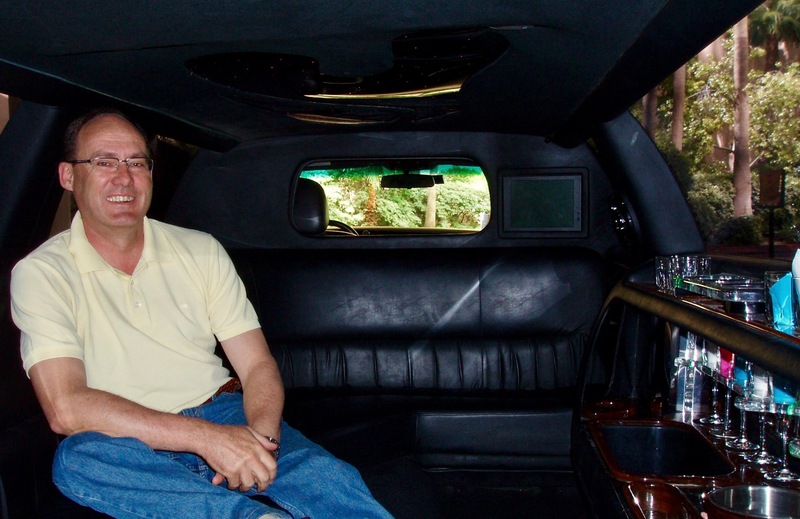 The company refunded the full price so this experience in the limo was a freebie. We were still disappointed as we had a flight booked the next day (to Washington DC) so we never got to the Grand Canyon. Maybe one day in the future. We did get to the Colca Canyon in Peru a few years later (see separate post if interested). Photo below: the pool at the Las Vegas hotel was huge; this is just 1 section – it meandered around the massive hotel garden complex – we’ve never seen anything so massively grandiose, not even in Asia where some of the resorts are very upmarket + also accessible/affordable for those other than the super rich. So…to sum up, our trip to Vegas was interesting/memorable but would we return? Probably not – all very artificial like a massive theme park. We prefer places where you can find a living culture still happening – sometimes you need to look beyond the well beaten tourist trails but there are still plenty of places (too many to visit in our lifetime) out there. For that reason, we generally avoid the huge 5/6 star hotels/cruises etc. We are considering a smaller cruise off the coast of Norway next year – an Australian friend is doing that this year so we’ll be interested to hear what she has to say about it all. Tony is also keen to go to Cuba but I don’t want to do long road trips so we might consider Havana for a few days and then a short cruise. We’ve heard that it’s quite difficult to independently travel through Cuba without a very good grasp of Spanish – even then a friend of ours found it difficult at times last year.